Llaima (Chile). Steam-and-gas plumes were observed rising from the main crater and E flank during 14 November-1 December. Although seismicity generally decreased, a new type of long-period, low-frequency earthquake was detected. An overflight on 4 December revealed fumarolic activity and some sulphur dioxide emissions coming mainly from fissures on the N crater wall and outer E and W flanks. The Alert Level was raised to Yellow, Level 3. Ambrym (Vanuatu). A diffuse plume from probably largely composed of sulphur dioxide was visible on satellite imagery acquired by the Moderate Resolution Imaging Spectroradiometer (MODIS) on 3 December. Chaitén (Chile). 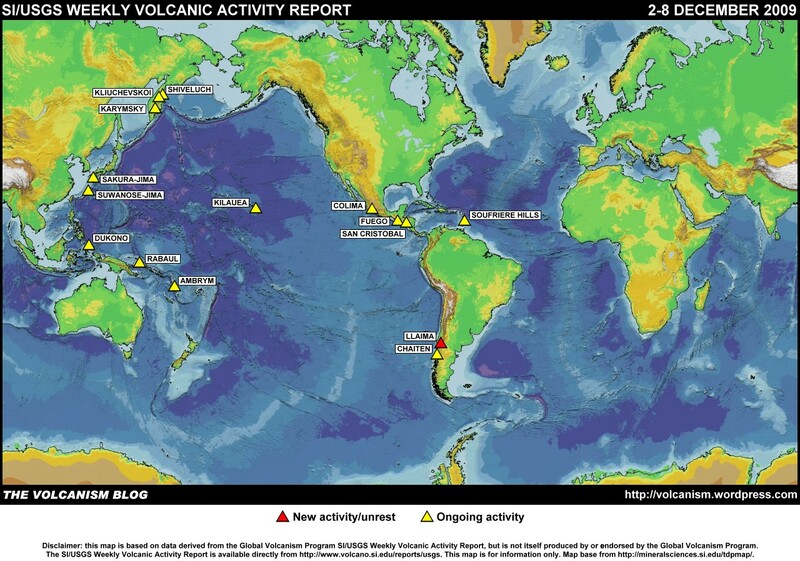 Buenos Aires VAAC reported that emissions from the lava-dome complex drifted 15 km SE on 8 December. Colima (Mexico). On 1 December a white plume rose 100 m above the crater and drifted E. On 2 December, incandescent tephra was ejected 50 m above the crater towards the SE. Later that day, a white plume rose 50 m and drifted SW.
Dukono (Indonesia). Darwin VAAC reported that during 5-6 December ash plumes from Dukono rose to 3 km a.s.l. and drifted 55-85 km NE and SE. Fuego (Guatemala). Multiple explosions on 4 December produced ash plumes that rose to 4.2-4.7 km a.s.l. and drifted 15-18 km W. Ashfall was reported in communities downwind. Rumbling noises and incandescent block avalanches were also noted. Karymsky (Russia). Seismic activity was above background levels during 27-30 November and 1 December. Data were not available during 2-4 December due to technical problems. Analyses of satellite imagery revealed a daily thermal anomaly and ash plumes that drifted 165 km E during 29-30 November and 1-2 December. The Level of Concern Color Code remained at Orange. Kilauea (Hawaii, USA). During 2-8 December lava flowed SE from beneath the Thanksgiving Eve Breakout (TEB) and rootless shield complex through a lava tube system to reach the ocean at multiple locations between Waikupanaha and an area 700 m farther to the W. Thermal anomalies detected by satellite and visual observations revealed active lava flows on the coastal plain. Incandescence was occasionally seen from Pu’u ‘O’o crater; on 2 December, incandescence originated from vents on the E wall. The vent in Halema’uma’u crater continued to produce a white or off-white plume that drifted E, W, and SW, and dropped small amounts of ash downwind. Incandescence originated from multiple spattering holes in the deep floor of the vent cavity. Kliuchevskoi (Russia). During 27 November-4 December seismic activity was above background levels and lava continued to flow down the ESE flank. Strombolian activity ejected tephra 300 m above the crater. Satellite imagery revealed a large daily thermal anomaly at the volcano. The Level of Concern Color Code remained at Orange. Rabaul (Papua New Guinea). During 27 November-3 December dense white plumes and gray ash plumes rose from Tavurvur cone. Strong explosions produced ash plumes that rose 1.5 km above the summit and showered the flanks with lava fragments that were incandescent at night. Shock waves rattled windows in the Kokopo area, about 20 km SE. Incandescence from the summit crater was occasionally noted. During 2-4 December, ash fell in Rabaul town (3-5 km NW) and other villages downwind. Based on analyses of satellite imagery, the Darwin VAAC reported that during 5 and 7-8 December ash plumes rose to 2.4 km a.s.l. and drifted 45-55 km E.
Sakura-jima (Japan). Tokyo VAAC reported that explosions during 2-8 December produced plumes that rose to 1.5-2.7 km a.s.l. and drifted in multiple directions. On 4 and 8 December, pilots 30-65 km S of Kagoshima airport reported ash plumes that rose to an altitude of 1.8 km a.s.l. and drifted SW and NE. San Cristóbal (Guatemala). Washington VAAC reported that on 6 December a gas-and-steam plume with possible ash drifted SW, and also noted smoke from local fires. Shiveluch (Russia). During 27 November-4 December seismic activity was above background levels, possibly indicating that ash plumes rose to an altitude of 4.5 km a.s.l. Fumarolic activity was seen with a video camera. Analyses of satellite imagery revealed a large daily thermal anomaly from the lava dome and gas-and-steam plumes, possibly with ash, drifting 70 km E on 27, 28, and 30 November. The Level of Concern Color Code remained at Orange. Tokyo VAAC reported that on 4 December an eruption produced a plume that rose to an altitude of 5.8 km a.s.l. Soufrière Hills (Montserrat). During 27 November-4 December activity from the lava dome continued at a high level. Pyroclastic flow activity was concentrated to the NE and W. The largest pyroclastic flows traveled NE down Tuitt’s Ghaut on 27 November and 2 December, reaching within 200 m of the sea. Associated ash plumes rose to altitudes of 4.6-6.1 km a.s.l. Pyroclastic flows also traveled W down Gages Valley, S down the White River valley and Gingoes Ghaut, and into the upper reaches of Tyers Ghaut (NW). One descended the Tar River valley to the E. Rockfalls cascaded directly from the summit of the lava dome into Tyers Ghaut. Ash venting from the S part of the lava dome was noted several times. Ashfall containing accretionary lapilli, reported from Salem, Old Towne, and parts of Olveston on the evening of 27 November, was associated with a pyroclastic flow down Tuitt’s and White Bottom Ghaut. The Hazard Level remained at 3. Suwanose-jima (Japan). Tokyo VAAC reported an explosion from Suwanose-jima during 5-6 December. Details of possible resulting emissions were not reported. 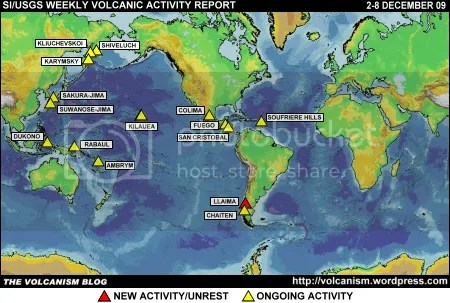 The foregoing is a summary of the Smithsonian Institution/United States Geological Survey Weekly Volcanic Activity Report covering 2-8 December 2009. It is provided for information only, and is based on but not a substitute for the full report, which comes with its own criteria and disclaimers. The map base is derived from the Smithsonian Institution/USGS/US Naval Research Laboratory This Dynamic Planet website.